Marvel's Black Panther has had an astounding run at the box office, with its $633.1 million domestic total surpassing 2012's The Avengers ($623.3 million) as the highest grossing superhero movie of all time, and it has also brought a big change to the comics as well. 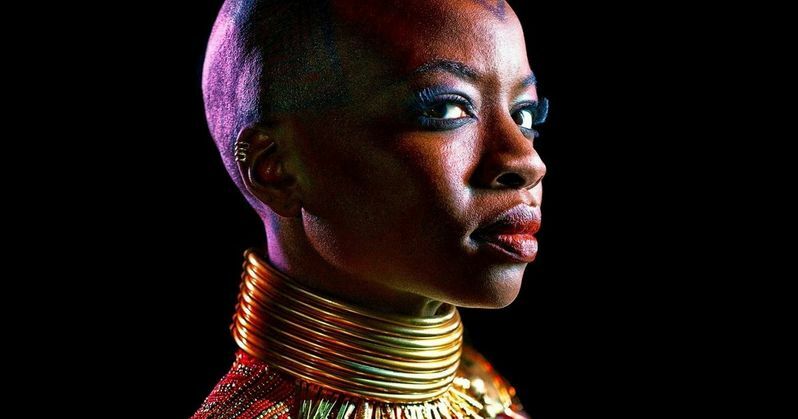 One of the main characters in Black Panther is Okoye, the general of Wakanda's secret service known as the Dora Milaje, played by Danai Gurira. While that character does have roots in the Marvel comics, she hasn't been seen in the comics for over 15 years, until today, with the release of Black Panther #171. The return of Okoye comes after other key Black Panther movie characters such as Everett Ross (Martin Freeman) and Nakia (Lupita Nyong'o) also made their returns within the pages of the Marvel comics after lengthy absences. Okoye was last seen in Black Panther #62 back in 2003, which wrapped up the primary arc for a Marvel comics character named Kasper Cole, who was essentially an American version of the Black Panther, but given the success of the Black Panther movie, Marvel clearly wants to capitalize by bringing these characters back. Okoye's return in Black Panther #171 comes as writer Ta-Nehisi Coates wraps up the Avengers of the New World comics arc while setting up some big things for the future. Okoye's return reveals that she has been imprisoned, along with T'challa's former lover Asira, as T'challa has been trying to rescue her with the help of Kasper Cole, Manifold, Storm and Shuri. The previous issue from last week teased that Okoye may have something to do with the impending doom Wakanda is about to face, but this new issue that debuted today revealed that is all part of Klaw's manipulation. Okoye debuted in Black Panther #1 in November 1998, the first in an iconic series of Black Panther comics by writer Christopher Priest, which also introduced pivotal characters like Nakia, Zuri and the Dora Milaje itself. That issue also featured the second appearance of Everett Ross, who debuted in September 1998 in Ka-Zar Vol 3 #17, which was also written by Christopher Priest and featured the new Black Panther as a supporting character, set in New York City. Fans can also look forward to more Okoye in the Marvel comics with the Dora Milaje getting their own comic book spin-off, a mini-series debuting this summer where the Dora Milaje team up with Spider-Man, The Avengers and the X-Men. Even before the astronomical box office success of Black Panther, there had been talk of spin-offs and sequels, although nothing has been confirmed by Marvel at this time. While the spin-offs may be further down the road, a sequel is almost a foregone conclusion at this point, but it remains to be seen who will be back for Black Panther 2, both in front of and behind the camera. While we wait for more, you can head over to Screen Rant for more on Okoye's return in Black Panther #171, which is currently available in retailers and online.